The UC True “Red Dragon” is scientifically known as Acropora carduus. 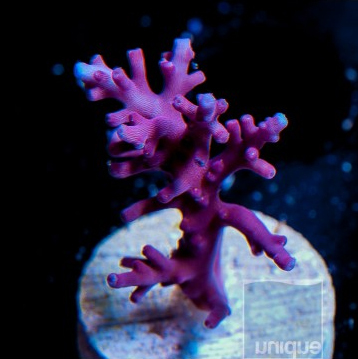 This attractive and very popular branching Acropora features a beautiful skeleton with exceptional red color often difficult to find in coral species. Shown below is one the amazing mother colonies which frags are taken from. A frag of the the UC Red Dragon with proper care will grow into a centerpiece in any reef aquarium. Red Dragon frags are currently selling for $74.00 each for a 1-1 1/2″ frag. These UC premium frags come from highly sought after maricultured parent stock and are colored up over time in their facility to a rich reddish pink. They do quite well in captivity and grow fairly quickly. Although they do not encrust in as robust a manner as other Acropora types, they will put down some skeleton on the frag plug over time. 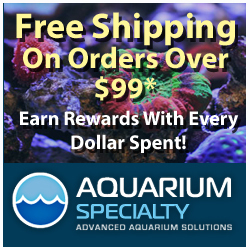 Unique Corals ensures each and every Red Dragon frag is held in their growout facility for several weeks before it’s available for sale. HUSBANDRY NOTES: Unique Corals houses the Red Dragon mother colonies about 16″ under the surface of the water and the grow-out tanks are illuminated by 20,000 k 400 watt Radium metal halide bulbs. The SPS colonies are fed with oyster eggs and other meaty marine based foods several times per week. Unique Corals claims they have witnessed noticeable color improvement and more rapid growth since they began dosing Triton Elementz balanced 4-part solution and Two Little Fishies Acropower on their growout raceways.